I know - it's been radio silence round these parts recently - and there are multiple reasons for that. I wasn't particularly well and, on a happier note, you know the job interview I had that I was rambling on about in this video (yes, the job I've signed a non-disclosure agreement to say I can't talk about on my blog/youtube and generally need to not ever mention!) well I got it! And I've only been there a few weeks now but it's been so busy - and I'm now working in addition to uni and my two volunteering positions and let me tell you, that might not sound like a lot, but there's no absolutely no day that I have that I'm at home and don't have somewhere I need to go. It's a bit horrible actually, but hopefully this job opens doors for me that I can pursue once I graduate - so if things work out it'll be worth a year of never getting enough sleep and never having any time to myself! I posted a video with these items last week and I'm so happy I've finally got round to doing this blog post because holding these items up does them no justice. Having said that, I don't even think these photographs even begin to convey this dress and coat combo's gorgeousness either. In real life this dress is the most flattering, beautiful cut but in the pictures I think the ruching detail can look like it's adding inches but in real life it takes them away. Red is my most worn and loved colour so it made complete sense that when boohoo got in touch I went for this one, but the dress also comes in black and for when party season rolls around I think I'll be ordering it in black too! Easy to wear, the type of material that doesn't crease if you're throwing it in a bag to take away with you, super flattering and the perfect length to make an impact but not be tripping over - I'd buy it in every colour if there was more than just two. But so often a beautiful dress can be marred by having to throw on whatever winter coat we have lying around, something waterproof to bundle us up against the elements. But the Jenny Coat is elegant and dressed up whilst still being reasonably long and warm. Of course it doesn't actually close over, which some might find an issue but I love the way it hangs. When these coats first came into fashion I thought they were too straight cut to ever be worn by someone with hips as wide as mine, but the way this particular coat falls is beautiful. But it's not just a nighttime coat - this will also be super appropriate for wearing to that job I've just got for when I need to meet with head office types and come across like I 100% know what I'm talking about, even if my knowledge on whatever we're discussing might have come courtesy of a google search 20 minutes before the meeting! 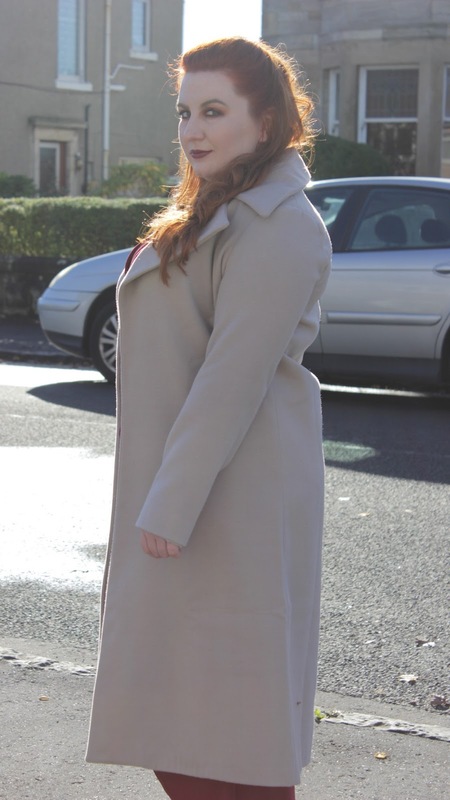 Even if this type of coat isn't your cup of tea I seriously urge you to check our Boohoo's selection of coats - there's really something for everyone and the prices are, as always, unbeatable! With the new job and changing seasons it's the time of year when I'll start shopping again - adding those pieces to my wardrobe I think are lacking, or just updating on something I loved last year but don't love as much this year, and it's fair to say most of us do the same. I'm also quite willing to bet that most of you are like me and are updating pieces that, although we don't love them anymore, are in perfectly good condition to be passed on. Boohoo have actually partnered up with TRAID which is an organisation which helps the people in the countries where our clothes are made to have a better standard of living. Did you know that in the UK alone 10,000 items of clothing are sent to landfill every 5 minutes and over 350,000 tonnes of clothing that is still wearable and could be sold in TRAID shops are landfilled or incinerated?! If we all donate our no longer wanted or worn items to TRAID we're reducing the environmental impact of this, as well as supporting a charity that supports the workers who allow us to get our fast fashion fix. 1. Book a free home collection and they’ll pick up direct from your door. Book online at www.traid.org.uk/collections or call 020 8733 2595. 2. Drop them off in one of their 11 charity shops if you happen to be close to one. 3. Drop them off at one of their 1,300 clothes reuse banks. Unfortunately for me none of these options are currently available in Scotland but this is a charity I hope to see grow and come to Scotland! Until then please do consider clearing out your wardrobes and donating the unworn items to a local charity shop - the funds raised from charity shops achieve great things and clearing out gives you more space to fill your wardrobe with items you love and that you'll wear again and again - it's win win! You look positively jaw-dropping. Actually speechless. Hope you're feeling tonnes better my love.